Throughout the years, the finest of human minds have tried to spread truths or knowledge that they had discovered, and challenged the common perceptions of their times. A large portion of those people were tortured, shunned, or paid with their lives. There is another way to bring knowledge to the enlightened person. The coding of knowledge in symbols has been one of the most common ways in human history. Another interesting way is conveying messages through books. Books are a more comfortable means of “digestion” by society, especially if the fundamental truth is obscured by a tale of fantasy or science fiction. Examples of this are “Gulliver's Travels” by Jonathan Swift which was actually a profound criticism of society, or “The Master and Margarita” by Mikhail Bulgakov which protested against Stalin and the communist regime. Assimilating criticism or truth that is hard to digest in a book is more comfortable because the reader receives the message through a filter of a fictional plot. Instead of slamming the truth in the reader's face, the message is transferred slowly to the enlightened reader. This form of symbolic coding or encryption existed and continue to do so throughout human history. A surprising source of this type of encryption can be found in Dan Brown's recent novel “The Lost Symbol”. In this novel, written in the form of a popular thriller, an important message is conveyed, a message that has been encrypted throughout the generations and has resurfaced throughout time. It is the human search for the divine and the eternal. From the dawn of time, mankind looked at itself and had seen the entropy, the extinction, and the change. The human fear of the upcoming end, had lead mankind to seek the eternal. The search had lead to several interesting phenomena. The first phenomenon is religion, which provided answers and a path for the masses. The fear of the end was transformed to a promise of eternal life in paradise for the believer after his death. Ancient civilizations such as the Maya and the ancient Egyptians dealt with religious rituals and preparations for the after life on a daily basis. Absurdly, the search for the truth lead to cynical exploitation of the masses and the use of “mediators” that "linked" those higher powers to humanity. This cynical cycle of exploitation of the masses by threats and fear lead the discoverers of the truth to encrypt the truth about the nature of reality and the true nature and ability of man. The truth was coded in artwork, architectural monuments, and philosophical and religious writings. In order to discover the secret of the ancients, we must go back to the ancient world. The ancients observed the complex universe around them with wonder. They discovered patterns and periodical cycles that repeat themselves in nature. Wonderful interactions and organized structures that suggested a mysterious and amazing presence of laws and set patterns in the universe. Discovery of geometric relations in the universe lead the lovers of truth, the ancient philosophers (the word philosophy is derived from two Greek words philo and sophy meaning love of truth) to the discovery of the “Golden Ratio”. It is a geometric ratio that exists in countless patterns and structures in the universe. The Golden Ratio or Golden Section is a ratio that is formed when a line is divided in this form (Figure 1) so that AB/AC=AC/CB. 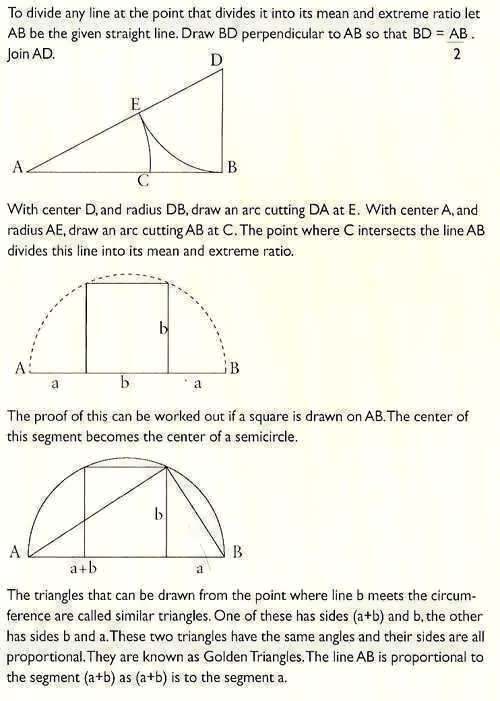 Namely that the ratio between AB and AC is equal to the ratio between the ratio between AC and CB. This proportion shows us that the ratio between all of the line AB to it bigger section AC is equal to the ratio between AC and the smaller section BC. When this is calculated mathematically the number 1.61803... is attained. 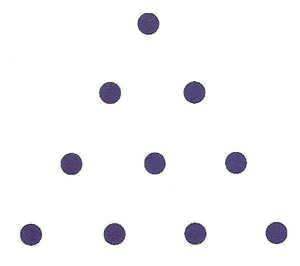 This number is known as Phi (φ) and this is it's mathematical equation (Figure 2). The Greek symbol of Phi is parallel to the sound “PH” in English and is used to represent the proportion of the Golden Ratio. The name Phi is derived from the name of the ancient Greek sculptor Phidias who was also a mathematician and built the Parthenon and the sculptures there based on the Golden Ratio. One of the surprising things regarding the Golden Ratio is the geometric law that represents the idea that the Micro and the Macro are the same. In essence, the Golden Ratio reveals to us that the laws that govern the motion of the starts and galaxies are the same laws that make up the human body. As the ancients dived deeper into the law they discovered more and more mysterious facts. They discovered that the law reflects the mysterious relativity between man and universe. The ancients actually discovered that through the laws of the Golden Ratio, they could unveil the secrets of the universe and find eternity. The first of the ancient mathematicians laid the foundation for the search for eternity. Euclid, in his first mathematical book “ Elements” which Albert Einstein called “The Devine Book”, laid the foundations for modern geometry. Along with it came Plato and the five perfect solids which hold the secrets of the Golden Ratio. Pythagoras (considered the father of philosophy) and his disciples claimed that the entire universe leans on mathematical laws. They believed that in its deepest level, reality is mathematical in nature, and that philosophy is a genuine tool for spiritual understanding. Moreover they believed that the human spirit can experience unification with the divine and that certain symbols have real mystical meanings. Over time this knowledge was forgotten and “rediscovered” in the Renaissance by men like Luca Pacioli, Leonardo Pisano Fibonacci, and more. The places where this knowledge was encrypted are surprising. "13: And God said unto Noah, The end of all flesh is come before me; for the earth is filled with violence through them; and, behold, I will destroy them with the earth. 14: Make thee an ark of gopher wood; rooms shalt thou make in the ark, and shalt pitch it within and without with pitch. 15: And this is the fashion which thou shalt make it of: The length of the ark shall be three hundred cubits, the breadth of it fifty cubits, and the height of it thirty cubits.” (King James Version). Also in the Book of Exodus when God commands Moses to build the Ark of the Covenant. “10: And they shall make an ark of shittim wood: two cubits and a half shall be the length thereof, and a cubit and a half the breadth thereof, and a cubit and a half the height thereof. 11: And thou shalt overlay it with pure gold, within and without shalt thou overlay it, and shalt make upon it a crown of gold round about.” (King James Version). Division of the measurements in both cases gives the number 1.666666....namely the Golden Ratio in an almost perfect manner. In the case of Noah's Ark, the numbers 3 and 5 are part of the Fibonacci series which is directly tied to the Golden Ratio and exists in countless places in nature. Actually the story of the Ark of the Covenant holds several ideas in it. The use of the Golden Ratio in the Ark of the Covenant represents the gate to the secrets of creation and divinity. 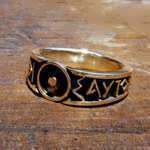 The Ancient Alchemy symbol for Gold happens to be the ancient philosophical symbol for unity and the beginning of creation. 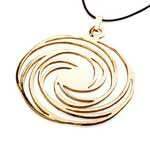 This is the symbol of the Monad. The use of this symbol ,the circumpunct, was used by the Greek philosophers and Pythagoras to represent the point of the beginning of creation. From this symbol one may evolve towards the additional rules of creation including the Golden Ratio. The Monad symbolizes the secret of creation and contains the idea of cosmic consciousness which experiences itself and learns from itself by observation and experience of the micro and the macro, and vice versa. The ancient alchemists used this symbol to represent Gold because Gold represents the divine and the eternal, since Gold is not subject to annihilation and entropy. The measurements of the Temple in Jerusalem and other hidden proportions claimed to be encrypted in the Bible kept many busy over the years. One of the researchers who tried to discover additional cosmic secrets from the structure of the Temple in Jerusalem was non other then Isaac Newton, the father of modern physics, who became engrossed in the Bible and in ancient Jewish mystical writings in order to find more encryptions of the secrets of the universe. The fact that many philosophers delved into esoteric and mystical writing raises two questions. The first being -do these ancient writings contain secret encrypted truths? The second: if so, what is this truth? The symbol of the Monad is a basic symbol, and from it another symbol is derived – the Tetractys. When I observed sacred numbers in Jewish tradition such as 5, 13, 26, and 72 I discovered them surprisingly in a consistent form in artworks of the great masters of the Renaissance and in the geometric structures the greek philosophers studied. If we take the most important symbol of the Pythagoreans – the Tetractys, we will find a surprising discovery. The Tetractys was to the Pythagoreans the symbol and the diagram of the entire universe. The meaning of the word Tetractys in Greek is “Fourfold”. The symbol of the Tetractys was so important to the Pythagorans that they used it as their oath. "By him that gave to our generation the Tetractys, which contains the fount and root of eternal nature…..". Now notice this. In the Bible the name of God is written as YAWH (יהוה) and the letters represent the cycle of time and the periodical motion of the universe. This name is comprised of the words “Was” (היה), “Is” (הווה), and “Will be” (יהיה). 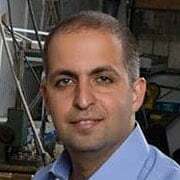 The name simply represents a state of "being" or "existence".In the Jewish tradition there are the 72 sacred names of God– these are 72 combinations of three letters that are created by sectioning the middle verse of the Bible in a certain way. According to Jewish tradition, with these combinations – creation was made. If you take the name of God in Hebrew (יהוה) and place it in the order of the letters in the Tetractys, you will get the number 72. Actually it is possible that if those people who were trying to decipher the “Names Of God” would have turned to geometry, they would have uncovered the big cosmic secret. 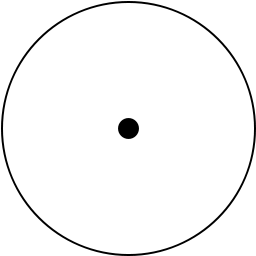 If the symbol of the foundation of creation is the Monad, the circle with the dot in the middle, what would happen if we would use the number 72? The circle is divided to 360 degrees since the days of the ancient Sumerians some 5000 years ago. Dividing the circle by 72 gives us five points from which we derive the Pentad. The Pentad was so secret and sacred in ancient times and the Pythagoreans used it as a secret mark to identify one another. They studied the geometric properties of the shape rigorously and since it was so secret to them the knowledge was passed on only orally. Knowledge of the Pentad resurfaced only during the Renaissance in Luca Pacioli's book (illustrated by Leonardo de Vinci) “De Divina Proportione” (The Devine Proportion) meaning the Golden Ratio. From the Pentad we can produce the Golden Ratio, if we use a triangle at an angle of 72 degrees we reach the Golden Ratio again. Of the Pentad, one of the five Platonic solids can be derived, the Dodecahedron. 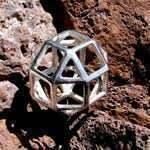 The use of the Platonic Solids (5 polyhedron structures , each being constructed from identical polygons) by Greek philosophers was common and they saw them as the elements of the universe, the Dodecahedron being the most important. 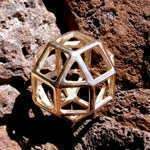 During the Renaissance some intensive research was done on the Golden Ratio, the 5 Platonic solids, and the Thirteen Archimedean Solids. The search for the use of geometric structures lead me to the famous and laden with symbology creation of Albrecht Dürer from 1514: Melancholia I. The old engraving depicts a winged character which represents the artist himself searching for the truth. The character is holding a compass and looking at a geometric structure. In the engraving, an hourglass is seen which represents that time is running out, and also a magic square with the number 34 which probably represent Jupiter. 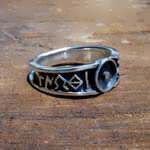 There are also other symbols with esoteric meaning. An examination of the structure of the engraving raises the conclusion most researchers agree on, that the base of the diamond like structure is based on the angle 72. Observation of Luca Pacioli's painting from 1495 reveals to us the tight link between geometry, the Golden Ratio, and art. 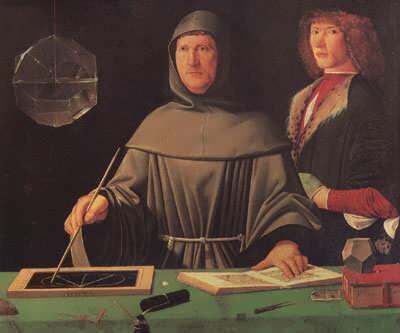 In the picture we see Luca Pacioli drawing one of Euclid's theorem and looking at a glass structure of one of the Archimedean Solids (the Rhombicuboctahedron) filled half way with water. On the table next to him a Dodecahedron appears (and by the way the other figure is probably Albrecht Dürer). So what is the hidden key which everyone has been searching for? As I was looking at the Tetractys and seeing how the letters of the name of God in Hebrew create the number 72, I realized that there was probably a tight connection between the Pythagoreans and the kaballa. Jewish Kaballa tried to tie between man and God and encrypted the idea that the human being can unite and become ONE with the CREATOR itself and become a creator by himself-this knowledge was hidden in esoteric symbolism. According to Jewish tradition, the secret formula to the universe is comprised of 216 letters and of 72 triple combinations. If we go back to the Bible and examine the numerical symbology that is found there, we will find (as I had already mentioned) that the proportions of Noah's ark are close to the Golden Ratio and the measurements of the ark circle around the number 3 and f which are a part of the Fibonacci sequence. In the story of Elijah on Mt. Carmel there is the use of the number 12 and there is a symbolic duplication that Elijah performs of 12*12 which is 144, the 12th number in the Fibonacci sequence. 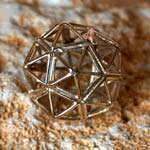 If we add the use of the 72 names of God and the explicit name of 216 letters we find that we get only one thing – a Dodecahedron. The 72, 216, and 144 are all part of the five angles of the Pentad we create out of the circle. 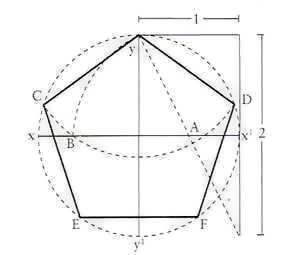 The 3 and the 5 being the geometric definition of the base of the Dodecahedron (3 Pentads around each vertex), the number 12 being the number of facets of the Dodecahedron. The more you gaze at the same old symbology, you realize that the ancients tried to find the way to the secrets of creation itself. The perception of the link between MAN and CREATION and seeing them as a micro-universe is the big secret of the philosophers and the mystics. 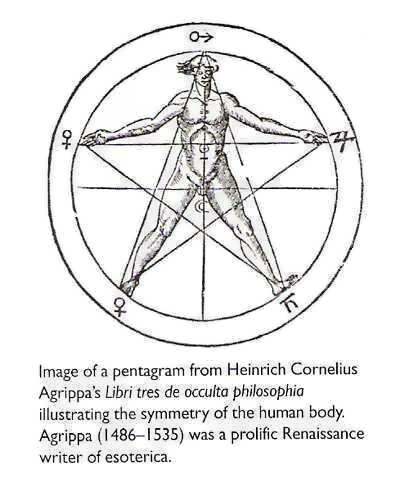 In the books of Heinrich Cornelius Agrippa, the 16th century astrologist and alchemist, the human body is depicted in parallel to a Pentad and other geometric structures. The entire universe and the Creator itself are reflected in each of us and in the ability of each of us to reach the same divine abilities. All of creation was formed in order for the Creator or this unity to learn and experience itself, because in a state of unity there is no relativity. The one can not experience itself. When those ancient philosophers began studying the universe through those geometric mathematical rules they were the micro studying the macro, or in other words it is the universe studying itself. Each of us is a reflection of the universe and the Creator itself. When I searched for a symbol for this idea I came back to Leonardo de Vinci and Luca Pacioli. 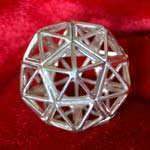 One of the structures that appears in the book De Divina Proportione and in Luca Pacioli's famous picture is the Rhombicuboctahedron – one of the 13 Archimedean solids. When the structure, as it appears in the painting, is examined closely, a reflection of the room can be seen and the view that is seen from beyond the window. The reason for this is that a spherical panoramic picture of 360 degrees can be projected on this shape in 180 degree precisely. 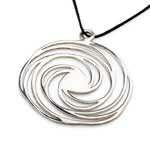 As a symbol, it is a structure that to me represents how the universe experiences itself through our eyes. Some years ago, scientists in the field of cosmology began measuring trace radiation from the big bang. Their calculations produced an interesting result. According to the latest calculations, our universe is finite and its structure is a Dodecahedron. How did those ancient philosophers reach that same understanding thousands of years ago? The answer is that all those geometric rules show us that we are the pattern of the universe itself and the knowledge of the universe exists in us and is waiting to be discovered.